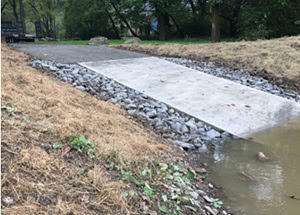 DEC operations staff completed a new concrete launch ramp at the Susquehanna River Cannon Hole Boat Launch in Tioga County. Also underway is the reconstruction of the Mud Lock Boat Launch on Cayuga Lake in the Town of Aurelius. This project will provide a much improved launch ramp, new boarding dock and paved parking and ramp access. The Mud Lock project should be complete by early November. Contact the DEC Region 7 officefor more information.